Now that there is more light and a little warmer temps, come to the “unofficial” Fun Runs. Meet on Tuesday at 5:30pm on the Montpelier Bike Path behind the Dept. of Labor. This will be a go as you please run for anyone who shows up. The real Fun Runs don’t start until May. The first unofficial run yesterday had one dedicated participant; see if we can improve on that next week! Your membership may be expiring in 11 days! Most memberships expire at midnight March 31. You can renew in person at the annual meeting or go to the website. If you are unsure of your membership status, contact Membership Coordinator Graham Sherriff and he will be happy to tell you. None this week! You should be resting for the second Race Series race, Kaynor’s Sap Run. It is on Sunday at 11am at Westford School. You can register ahead of time at GMAA. We had a good annual meeting this past Sunday. Minutes will be on the website soon. Congratulations to Ann Bushey for winning the St. Patrick’s Day drawing. The prize was a Red Hen gift card. 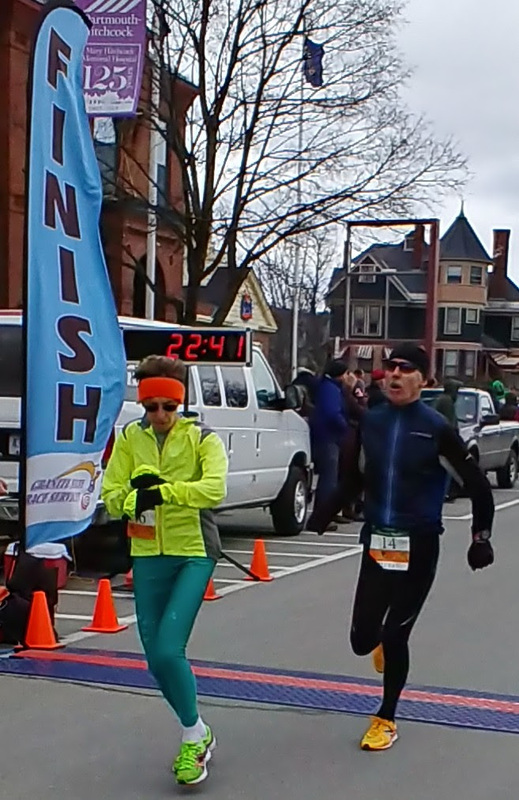 The half marathon race on Sunday, May 5 has offered CVR members a discount of 10%. There is a relay too. To take advantage, use discount code “CVR”. The Lasells didn’t win the prize drawing but made an awesome effort indeed! (not sure what Eric is thinking about this in the back there). (photo by Jeff Prescott). Phil Krajewski (and daughter Evangeline) after a 2nd place 70-74 division finish at the New York Half Marathon this past Sunday. His time was 1:44:20 which equates to an AG time of 1:13. Wednesdays at 6:30pm at the Brunswick School (formerly the Three Stallion Inn) in Randolph, Contact Hannah Barden or 802-728-2052 to get put on the email list.